University of North Texas Press, 9781574412888, 304pp. Louisiana’s Neutral Strip, an area of pine forests, squats between the Calcasieu and Sabine Rivers on the border of East Texas. Early in its history, the region developed a reputation as a harsh frontier where grit and tenacity became indispensable tools of survival. During the Louisiana Purchase, bureaucrats from both Spain and the United States squabbled over the exact boundary line between the two rival powers. Both governments removed militia from the contested land to avoid war. Intensifying its reputation, the region served as an official buffer zone. Without the security of a military presence, residents quickly realized they would need to protect and govern themselves. Soon, tight-knit communities formed, and residents developed a reliance on self, kin, and neighbor. In the early 1900s, the timber boom sliced through the forests of East Texas and the former Neutral Strip, disrupting these dense communities. Mill towns sprang up, and the promise of money lured land speculators, timber workers, unionists, and a host of other characters, such as the outlaw Leather Britches Smith. The entrenched local residents soon confronted not only these new community members but also a dynamic cultural moment that struck a defining blow in the making of the region. That moment continues to shape the place’s cultural consciousness, and people fashion a lore connected to this time. In a fascinating exploration of the region, Keagan LeJeune unveils the legend of Leather Britches, paralleling the stages of the outlaw’s life to the Neutral Strip’s formation. 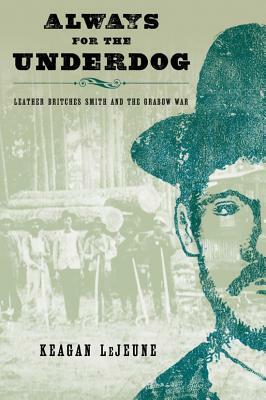 LeJeune retells each stage of Smith’s life: his notorious past, his audacious deeds of robbery and even generosity, his rumored connection to a local union strike—the Grabow War—significant in the annals of labor history, and his eventual death. As the outlaw’s life vividly unfolds, the book also reveals the area’s history and cultural landscape. Often using the particulars of one small town as a representative example, the book explores how the region remembers and reinterprets the past in order to navigate a world changing rapidly. Drawing from newspapers, court records, and a decade of interviews and observation, LeJeune offers a penetrating examination of the interplay between legend and place, exploring Smith’s own life, this unique historical moment, and the place’s mysterious landscape. The book also considers how contemporary festivals and other forms of cultural heritage employ the legend as a cultural recourse. To stay vibrant and meaningful, culture constantly re-makes itself; here, the outlaw occupies a vital role in the re-creation. KEAGAN LeJEUNE is Professor of English and Folklore at McNeese State University. Born in Louisiana, he has studied and traveled Louisiana’s Neutral Strip for more than a decade and has completed an annotated bibliography of research on the region. LeJeune has served as President of the Louisiana Folklore Society. He lives in Lake Charles, Louisiana.